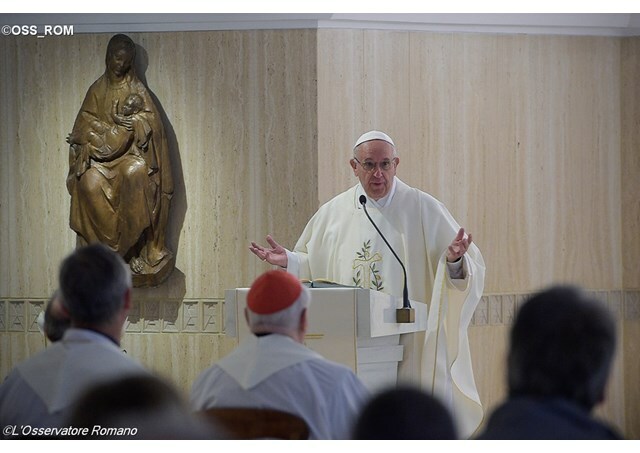 Pope Francis addressed the faithful gathered in the Casa Santa Marta for morning Mass on Monday and reflected on the First Reading of the Day. Pope Francis told believers that there is no true humility without humiliation. The Pope was speaking during morning Mass at the Casa Santa Marta on Monday as he reflected on the first liturgical reading of the day which speaks of the humiliation of King David. Pope Francis said David was indeed a great man: he had overcome Goliath, he had “a noble soul” because twice he could have killed Saul but he had not done so. But David, he continued, was also a sinner: he had committed the serious sins of adultery and had arranged the murder of Uriah, Bathsheba’s husband. “And yet, Francis noted, the Church venerates him as a saint" because he let himself be transformed by the Lord, he “accepted” forgiveness, he repented and recognized himself as a sinner. The First Reading, the Pope said, focuses on the humiliation of David: his son Absalom revolts against him but at that moment David does not think of “saving his own skin” but of saving his people, the Temple and the Ark of the Covenant. He flees, he explained, and his gesture that appears cowardly is really a courageous one: “he wept without ceasing, his head was covered, and he was walking barefoot”. Pope Francis noted that the great David is humiliated not only by defeat and by flight, but also by insult. In fact, during his escape, a man named Shimei “cursed and threw stones at David” telling him that the Lord had requited him and put the kingdom in the hands of his son Absalom. Shimei, the Pope continued, tells David that he is now suffering ruin “because he is a murderer" and David lets him continue to curse and insult him saying: “Perhaps the Lord will look upon my affliction and make it up to me with benefits for the curses he is uttering this day." “Sometimes we think that humility is to go quietly, perhaps head-down looking at the floor… but even pigs walk with their heads down: this is not humility. This is that fake, ready-to-wear humility, which neither saves nor guards the heart. We have to be aware that there is no true humility without humiliation, and if you are not able to tolerate, to carry humiliation on your shoulders, you are not truly humble: you pretend you are, but you are not”. The Pope pointed out that both David and Jesus burden themselves with sins and said: “David is a saint, and Jesus, with the sanctity of God, is really a saint” and they are both humiliated. “There is always the temptation to counter slander and oppose anything that humiliates us or makes us feel ashamed - like Shimei. But David says “No”; the Lord says “No”, that is not the right path. The path is the one taken by Jesus and prophesied by David: bearing humiliation. ‘Perhaps the Lord will look upon my affliction and make it up to me with benefits for the curses he is uttering this day’: turning humiliation into hope. Pope Francis concluded warning that humility is not justifying oneself immediately in the face of an offense and trying to look good: “if you are unable to bear humiliation, you are not humble” he warned: “this is the golden rule”. “Let us ask the Lord for the grace of humility, with humiliations. There was a nun who used to say: ‘yes, I am humble, but never humiliated!’ No, no! There is no humility without humiliation. We are asking for this grace. And if someone is brave – just as as St. Ignatius teaches us - he can even ask the Lord to send humiliations so he can be more like the Lord”.